I haven’t yet introduced my husband to you all. For the few of you that already know him, you also know that he’d be perfectly okay with that oversight. Let’s just say he prefers something we call The “Keeping To The Background” Scene. In fact we have an ongoing battle on Instagram where I attempt to get photos of him looking into the camera, and in return he thwarts each one. He’s either in the distance, turned with his back to me, in a motor cycle helmet for no reason, or blocking his face with a prop. I’m going to start calling him “Wilson” (props to 90’s T.V). Up to now I had been calling him “Perry”, which I’ve been told ISN’T his real name but it clearly says “Perry Ellis” on the sides of his glasses, and naturally I assumed it was his special way of saying he preferred it over his birth name. No wonder he never answered me till now. Go fig’. Anyhoo… I thought it was about time I brought him onto the blogging scene. Because I want to address something so very important when we talk about why it’s vital to get an official diagnosis. Not just a blog about faith, this is a blog about chronic depression too. But to do that, let me backtrack a little? You know it’s important to get an official diagnosis if you are even remotely sure you have some kind of mood disorder or depression, right? Let this be said loud and clear: You CANNOT diagnose yourself and expect to suddenly be okay. Things need to be addressed that only a professional can track and treat. There are characteristics to depression and mood disorders that look like so many other things. So put pride, fear, and shame away. And speak to someone who can give you the info required to make progress. Whew… okay…so let’s move on ahead and trust that you understand a diagnosis is important. BUT did you know that…. ….. a diagnosis isn’t just for you? This important step is also for your spouse. Your partner. Your better half. Avoiding a diagnosis means your spouse, or anyone else in your family perhaps, misses out on a gift. It means you wind up robbing them of something they’ve been needing restored to them, perhaps for a very long time. That something is a more freeing, more authentic relationship with you. When you are given an explanation for why you’re suffering with something formerly unexplainable, you give them freedom. So I lived and suffered with Dysthymic Disorder for my entire marriage, something that started long before that. There always seemed to be some reason or another to explain why I felt so crappy, for why I was like I was a useless human being for all those years. And until it got so bad that I found myself unable to leave the bedroom most days, it went undiagnosed. We just assumed the issue was with me or with us or with life, and I needed to get over myself. So, as my spouse, the one who was going to see us through for better or worse, my husband also struggled with every conceivable issue in regards to maneuvering through a relationship during all of this! My symptoms became all the ways he couldn’t make me happy. My crying jags he would assume were always his fault somehow. Or he would spend days perplexed at what to do about them if they weren’t. And I was not above blaming him on days when I couldn’t put my finger on what went wrong. Because, of course, it certainly couldn’t have been ME could it?! He would carry around guilt, it followed him like the plague. He felt bad that I was restless, anxious, and unproductive. He was constantly worried there was more he wasn’t doing but he could never figure out what. He would go through all the various parts of each day exhausted. He’d try to help my insomnia, he’d sit by me in the dark, and listen as I would try to find reason in the unhappiness, dismay, and fear, often this would go on till 3 or 4 am till I’d crumple back into bed for a fitful sleep… then he’d head to work first thing, then run errands, then help the kids, then tip toe around me unsure if it would be another repeat. Oh sure, there were the okay days, okay months even, where life felt doable, and maybe we were in the clear. But at some point the lows would hit, and no amount of prayer, counselling, or heart-to-hearts would mend the gaping crevasse we now know was early onset chronic depression. If you asked me today, I’d say my hubby is one of the most loyal and committed men I’ve ever known, and what I can see clearly now as I look back at the way my constant lows affected our day-to-day lives is that he too was forced to battle an unknown enemy almost to the point of exhaustion. And had no idea if we would ever make it. To his credit he never gave up. Gave in to the lowness? Yes, often it spilled over onto him. But gave up? No. I don’t say all of this to flaunt how wonderful it is to have him be the rock he is. And he is. I will say this; if you are going through this right now, and are investing in a similar sounding relationship, I salute you and hope your better half or family member knows just how amazing you are! But I say all this to say how much a diagnosis takes all the weight off of your partner’s shoulders and allows them room to realize they are not the cause. That’s HEALING for more than just you. And God can sweep in and revive and redeem every hard or missed moment that they have carried thinking they were part of the problem. He will be able to carry every new burden in future. He can inject His strength and healing back into what felt weak and broken, when you receive a diagnosis for more than just you. It’s also freeing to find out that there are things they can do to help during the next steps of your disorder or illness, the next steps to wellness, and the next steps to the relationship you both really want and need. That is definitely an upcoming topic. I promise you! But in the meantime, your bravery in seeking a diagnosis, however long that takes, gives the people you care about a gift. Fear, guilt, confusion, loneliness, frustration, failure, and exhaustion can be the burden they no longer have to carry within your relationship in regards to better mental health. Your diagnosis is too important. It’s for more than just you. 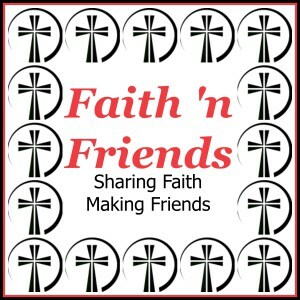 and I pray you’ll join us as we all share words of comfort from our faith perspectives! Let’s Get Something Good Going! How important this issue is, Christine! Our spouses struggle when we do. Sometimes even more. I knew there was a reason why Richard was my favorite son in law! Give him a hug for me today. He’s the best in the world. I’m thankful that you are sharing. I’ll encourage you every step of the way. I’ll tell Perry you say hi… lol. I hope spouses read this post together, and that it helps someone on the fence about sharing. Christine, I’m happy to know that God took control of every situation in your life. And that you allow Him to be glorified in you, your spouse, your marriage and family as well. The knowledge it’s important because makes us less vulnerable to be more affected by not knowing how to deal sometimes with those situations. Thanks for sharing and encouraging in Words of Comfort Link up. Hope to you see again and read more about you and what God has done in your life. Blessings to you!